Below are various resources that summarize the success of the Akamai internship program, various aspects of the program, and additional research that has been done to supplement the program, such as valued workplace skills. Please feel free to distribute with credit attributed to the Akamai Workforce Initiative, Institute for Scientist and Engineer Educators, and additional authors of individual documents. Other resources include documents and readings that supplement the existing programs. Contact us at akamai@ucsc.edu for any specific requests, we are happy to support you if you would like anything customized for your use! Click for the 2-page, printable Akamai Highlights page, produced in 2018. Includes our latest tracking outcomes of Akamai success! This brief presents an external perspective on the design of the Institute for Scientist & Engineer Educators, its relationship to the Akamai Workforce Initiative, and the contributions of ISEE to local workforce development at multiple levels. It also distills broader design lessons that may be of interest to other STEM workforce development initiatives. 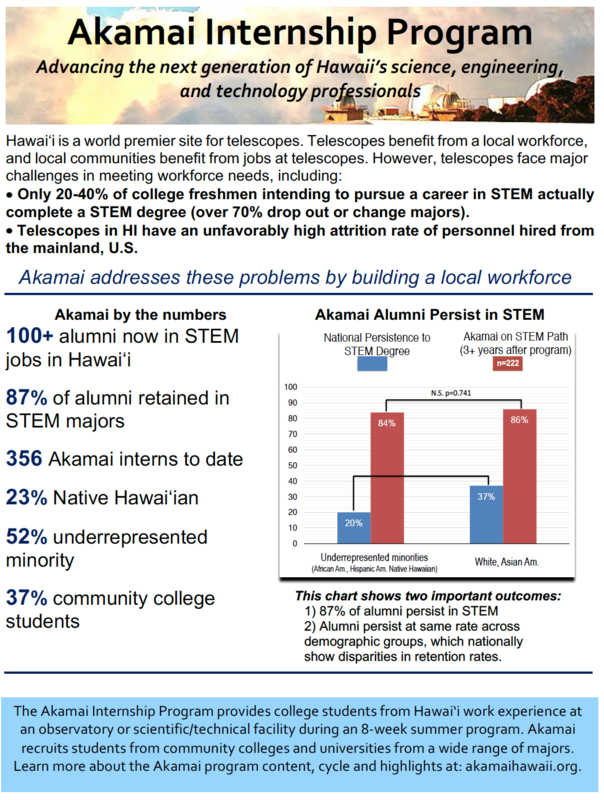 This brief presents an external perspective on the Akamai Workforce Initiative. It describes the rationale, history, and key design features, as well as the details of the Akamai Internship Program. This brief presents an external perspective on AWI and is authored by Inverness Research. Inverness collaborated with leaders of iSEE and AWI to examine the returns on the long-term investment in AWI.